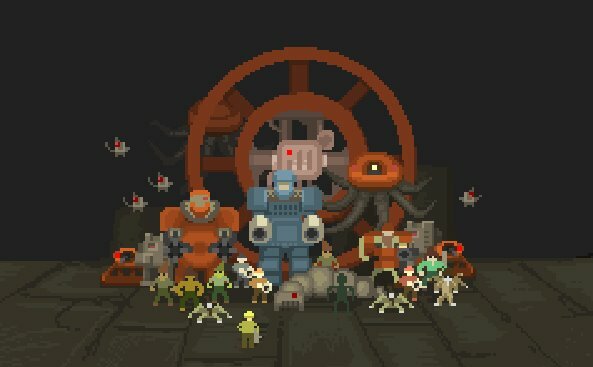 "A Roguelike top-down shooter with pixel graphics." Before I had even finished reading this description, I was PayPal'ing $13 USD to the folks behind the game, anxiously awaiting the first playthrough. Information about the origins of Teleglitch are mysterious, much like the game itself; the Facebook page has only a handful of posts, and the official site contains no wisdom as to the background of its creators Johann and Mihkel Tael. I am fine with this, as the sublime beauty of the game is what matters here, and that you purchase it immediately, if you're a fan of Quake, Doom, Alien Breed, the Aliens franchise, or roguelike and survival horror genre games in general. On the surface, the game is quite simple. Players control a scientist trapped in a military research and training facility (on faraway planet Medusa 1-C) inhabited by facility personnel that have been "killed, microchipped, and reactivated as combatants by the central processing AI of the facility." Well, OK then. Sounds spooky enough, but how is the gameplay? The lone scientist is controlled using a pretty solid combination of keyboard and mouse; the keyboard for movement, the mouse for aiming and firing. Veterans of top-down shooters and FPS's will feel right at home here, and novices are bound to pick it up quickly. The inventory system isn't great, but it's functional and otherwise doesn't get in the way of gameplay. Right away, an ominous sense of fear and foreboding should encompass you, from the moment you begin moving. There's no music, no sound - just the mechanical buzz of sliding doors and your footsteps. Walking outside provides no feedback other than the whistling wind. Something is going to happen. And something will happen, soon. That something will come in the form of a zombie, spider, or other dangerous creature out to destroy, maim, or otherwise end your existence. As you explore the randomly generated buildings and outside areas, these creatures will grow in number, dancing around you, draining you of precious life if your aim isn't sharp enough, your knife skills honed enough. Fortunately, Teleglitch also contains an item creation mechanic, in which players can craft enhanced weapons, explosives, and more to ease their time in this hellish place. And the weapons - oh, the weapons. The aural feedback is awesome; clear, visceral, and loud, the reload sounds immensely satisfying. There's something raw about this game. The developers have done an amazing job balancing many factors to produce something that is much greater than the sum of its parts. For example, risk vs. reward: Should I fight the horde I detected and grab the supplies in the cabinet? Or save my life points and advance to the next stage? Resources are just scarce enough that survival is feasible... barely. Permadeath is embraced and celebrated - on level one, it's no big deal, but by level 4, every step could be your last, creating a real sense of nail-biting urgency and caution. If anything about Teleglitch could be viewed negatively, I'd cite its punishing, unforgiving difficulty (no saves in between levels... none) which some will relish, and others despise. In addition, its lo-fi presentation will be charming to players from my generation and those who grew up filling in the graphical gaps of older video games with the wonder that is a young imagination, but it may fall flat for those expecting the visual experience of a modern-day AAA title. Finally, I have some very minor gripes about the controls, especially with the inventory control, which is somewhat awkward (but as I stated earlier, nowhere near bad enough to interfere with the game.. just not perfectly elegant). 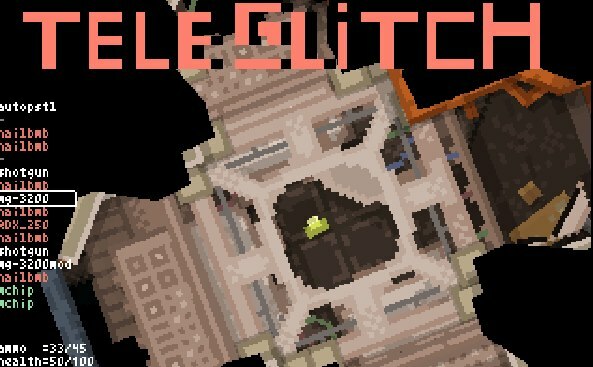 For anyone willing to get in the right mindset and who digs a unique, truly terrifying roguelike romp, Teleglitch is a must have. Download the demo/buy the game here (from the Teleglitch website). This looks like it could be a lot of fun. For some reason the video makes me think of the time in Halls Of The Things where I've come around a corner and have to retreat, blasting fireballs and lightning all over the place! Indeed a really great game. I keep coming back to the demo (haven't reached its end yet) and get better at the game each time. Excellent gameplay.